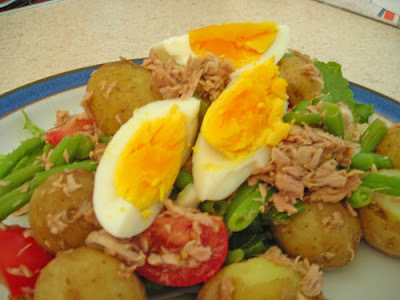 Lunch today was Salad Nicoise, with new potatoes, french beans, tomatoes and tuna on a bed of lettuce. 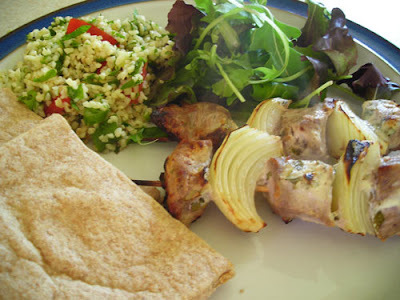 Supper was Minty Lamb Kebabs with pitta bread, tabbouleh and salad. The tabbouleh is a recipe by Rose Elliot in The New Vegetarian Cookbook, not so new now as it was published in 1986! I've included the recipe below. 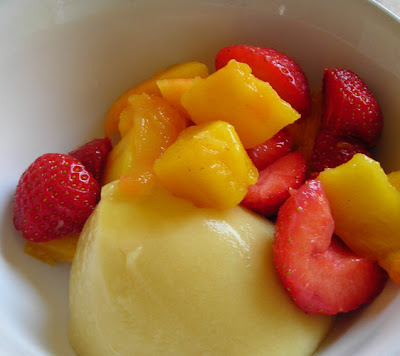 Coconut Orange Jelly with strawberries and mango. This was a little experiment, I had half a can of coconut milk left after making a Thai prawn curry last night, so decided to make a 'milk' jelly. Very simple, melt the jelly as per packet instructions add the coconut milk and enough cold water to make up to 1 pint (or as the instructions on the packet) pour into a dish and put in the fridge to set. You do have to go and give it a bit of a mix after about 10 minutes or it will separate but I only had to do it once. It was really delicious with the fruit. Put the wheat into a bowl and cover with boiling water. Leave for 10 -15 minutes, until the wheat has absorbed all the water and puffed up. Add the lemon juice, oil, chopped parsley, spring onion, mint and tomato. Mix well and season to taste. Put two lettuce leaves on two serving plates or in one large blowl, then spoon the salad mixture into the lettuce leaves. Garnish with the lemon and tomato slices.